INDIANAPOLIS — In pursuit of the school’s third national championship, the Baylor Lady Bears were named the top seed of the 64-team field for the 2019 NCAA Division I Women’s Basketball Championship. The NCAA Division I Women’s Basketball Committee awarded No. 1 seeds to Baylor (31-1), Notre Dame (30-3), Louisville (29-3) and Mississippi State (30-2). All four schools come into the tournament having won or shared in their respective conference regular-season championships. Baylor, Notre Dame and Mississippi State also won the Big 12 Conference, Atlantic Coast Conference and Southeastern Conference tournament titles, respectively. Baylor, which comes into championship play having won 23 straight games, previously claimed national championships in 2005 and 2012. The defending national champion, Notre Dame, has won nine straight. 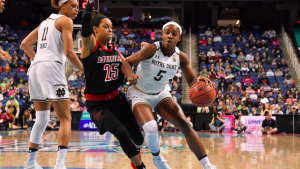 The Fighting Irish also are in contention for the school’s third national title, with previous trophies earned in 2001 and 2018. Louisville was the runner-up for the national championship in both 2009 and 2013, while Mississippi State had second-place finishes in both 2017 and 2018. Tennessee continues its appearance streak and is the only school to participate in all 38 NCAA Division I Women’s Basketball Championships since its inception in 1982. On the other end of the spectrum, Abilene Christian, Bethune-Cookman and Towson all are making their first NCAA tournament appearances. Thirty-two conferences were granted automatic bids for the championship, and the remaining 32 teams were selected at-large. The first and second rounds of the 2019 NCAA Division I Women’s Basketball Championship will be played March 22-25 on the home courts of the top 16 seeds: Baylor, Notre Dame, Louisville, Mississippi State, UConn, Stanford, Oregon, Iowa, NC State, Maryland, Syracuse, Iowa State, Miami (FL), Texas A&M, South Carolina and Oregon State. South Carolina will host in Charlotte, North Carolina. Regional action will take place March 29-April 1, with Albany, New York (Times Union Center), and Portland, Oregon (Moda Center), hosting on March 29 and 31, while Chicago (Wintrust Arena) and Greensboro, North Carolina (Spokane Veterans Memorial Arena), will host regional games on March 30 and April 1. The 2019 Women’s Final Four will be held April 5 and 7 at Amalie Arena in Tampa, Florida. In the 37-year history of the NCAA Division I Women’s Basketball Championship, 15 schools have captured the national title. UConn leads the way with 11 national championships, followed by Tennessee with eight.